This talk discusses the burgeoning field of Indigenous Science, Technology, and Society (Indigenous STS) and the Indigenous, feminist, and queer theory informing it. It explains the cross-Canada (in part virtual) network being built to train and mentor students who, because they work on Indigenous issues, are often tied to specific places. The program is also built within a critical global Indigenous studies context that pays attention simultaneously to being locally/ regionally grounded. 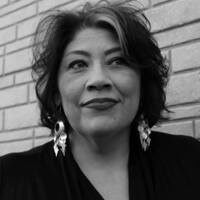 Kim TallBear, Associate Professor of Native Studies at the University of Alberta.